I was never the kind of kid who read graphic novels—it always seemed to me to be a world that I just couldn’t break into. Every time I got my feet wet, I would run into someone who had such an intimidatingly deep well of knowledge about Watchmen or Spiderman that I figured I could never achieve that level of devotion and so didn’t bother to try. I guessed that I would always appear on the fringes of that world, a bit unwelcome, a bit of a try-hard. And comic-lovers were people, in my mind, who’d spurn fake fans, like I’d inevitably be. I got over this, though. Which is not to say that now I’m deeply enveloped in this world. (I’m not). But my great realization was that I don’t have to be the greatest comic devotee in order to deeply enjoy certain graphic novels for what they are: gorgeous pieces of storytelling. Graphic novels are really pretty amazing in that they are an avenue that allows readers to viscerally explore fantastical worlds, to witness art and writing in constant dialogue. They allow for the exploration of color, fonts, and design in incredible ways. There’s really nothing like the experience of reading them. And so I’m a little sad I didn’t let myself get into them for so long. It was only upon coming to college and meeting with new, graphic novel-loving friends, and Olin’s small (but good) collection, that this love could grow. If you, too, are looking to get into graphic novels but aren’t sure where to start, or are a little intimidated by the sheer number of series out there, I’d really recommend reading Saga. Saga is a sci-fi-ish, romance-ish, fantasy-ish series set in space, following the unorthodox love story of characters Marco and Alana. The pair emblematizes the definition of star-crossed—Alana hails from the planet Landfall, while Marco hails from Wreath, Landfall’s moon. Landfall and Wreath are locked in an incredibly bloody war, which involves half of the galaxy. Marco and Alana have a daughter, Hazel, who has the horns of Marco’s people and the wings of Alana’s. Hazel is a bit of a symbol of peace (or a mutant, as some characters view her), but she is also the narrator of the story, guiding readers through her birth up through her childhood, as her family fights for survival. Saga is a fabulous series, in part because of its accessibility, but mostly because it’s engrossing as hell. It’s full of well-developed, strange characters. Take Upsher and Doff, a journalist and a photographer, also a couple looking to prove the existence of Hazel. The two hail from a homophobic planet of fish-people, and as they navigate getting the scoop, they must also navigate trying to exist in a world that rejects them. Other characters swirl in and out of the pages: a novelist writing anti-war rhetoric under the guise of trashy romance novels, a babysitter who’s actually just the ghost of a dead 15-year-old girl. The most recent volume of Saga, Volume 8, came out this past December, and I finished it in about an hour a couple of days ago. This particular issue (spoiler alert!) covers the process of Alana finding a way to get her dead second child removed from her womb, as well as the torture of the mercenary The Will, who, early on in the series, was also on the hunt for Marco, Alana, and Hazel. The series refuses to be morally black and white, providing complex histories and motivations for people on all sides of the war, ensuring no character is 2-dimensional. To be honest, this is probably my least favorite issue of Saga so far. In a conversation with my friend Grace, we parsed out why that was the case for us, and we realized that it’s because this issue seems to pick up a lot of different story arcs—like the abortion, the family of centaurs—that are subsequently dropped off. Perhaps they’ll come back in later issues, but for now, it sort of feels like I was reading this issue just to get to the next one. Most issues don’t follow this pattern, though. The series in general is well-worth a read. It’s fast-paced, incredibly engaging and full of likable, complex characters. In addition, the paneling of images isn’t too complex (something I’ve run into with other graphic novel series). So, in general, it’s really excellent for someone just dipping their feet into this kind of reading. Reading Saga is also romantic for me, in a way. It lets me imagine what it would have been like to collect comic books as a kid, waiting for the next issue to come out, and when it finally does, gulping it down in minutes before pouring over it more slowly later, admiring the pictures, taking in the plot. It’s a beautiful medium, really, and in college, a convenient one. The graphic novels are purely escapist and don’t require much deep thinking, which means they’re a fast break from the ordinary hectic nature of college life. 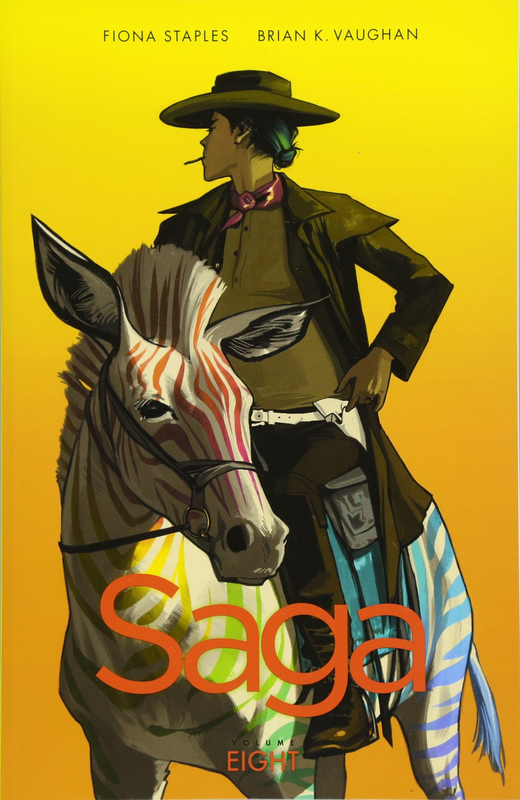 I’d highly recommend reading graphic novels in general, and Saga is a wonderful way to enter into this world.